It’s 1997. A stylish blond hurtles down Broadway in a convertible Jaffa-red Toyota Celica — chairs, vases and barstools teetering precariously on the back seat. Behind the wheel is Dinah Malyon, CEO of New Zealand’s first homestaging company, DMI Homestagers, in her first year of business. Little would you have known, the furniture and accessories were borrowed from friends, and the sports car her only asset after a recent relationship breakup. That was eighteen years ago. Today, Malyon sits at her desk, crammed with tidy piles of paperwork and bulging manila folders, in a corner of her 18,000-square-foot Parnell warehouse — an Aladdin’s cave of fabric swatches, towers of cushions and shelf after shelf of cake stands, candlesticks, bowls and silver-topped canisters. Flicking through the New Zealand Herald’s Property Press in the 1990s it was common to see photographs of bare rooms. These days, the homes advertised look effortlessly chic thanks to homestaging becoming a regular feature of a seller’s marketing budget. 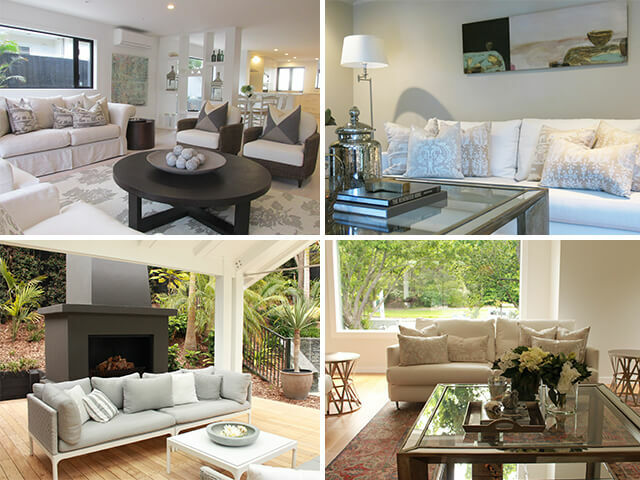 Pene Milne of Milne & Co. Real Estate estimates homestaging increases a property’s sale price between six and ten per cent, and often substantially more. “If you don’t do it well, it de-values your property. If you’re going to do it, it needs to be done right.” Malyon is a busy woman. In addition to homestaging work, she is the interior design consultant for a 50-house development in Mangere Bridge and has a television show audition to consider. She enjoys the pressure of deadlines and a vast work load, and retains love for her work. “I still feel instant gratification when I view a home’s transformation.” During our hour together — and somehow not affecting the conversation flow — she pays the car-cleaner (by cheque), meets and greets a walk-in client and sets a meeting for later that afternoon, arranges delivery of an artwork, and confirms by phone that the Milford house accents are to be coastal and pale blue. Does she ever stop? Apparently, yes. She has a second home at Waiheke and loves nothing more than to sit in a chair and, well, think about work. An avid socialiser, she has become close friends with property industry contacts made in her early business years. Amongst her design heroes are award-winning interior designers Jen Pack and Virginia Fisher. Malyon is passionate about many objects in her warehouse, pointing out a pair of matt grey bowls that were “hideously expensive” but have earned their keep gracing the kitchens of several multi-million dollar homes over twenty years. But there are precious things she will not loan out: her Hotere artwork, a two-decade-old set of Corso de Fiore tortoiseshell vases and her Sid Dickens Italian tiles. We say goodbye, and in a gorgeous nod to the woman she was in 1997 — tearing through Newmarket with a back seat piled high with borrowed furniture — she throws a pile of bedding and a vase in the back of her black BMW and toots twice, off to conjure up the next home transformation.